Kenya and Burundi have recorded good rise in the latest FIFA Rankings. 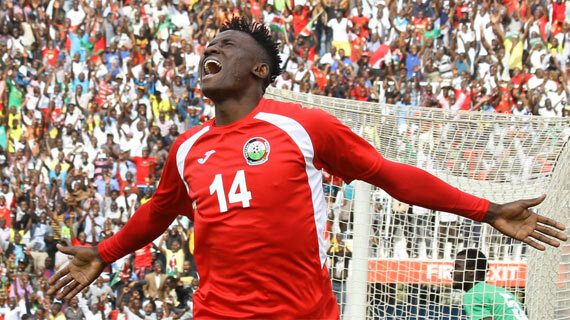 Olunga celebrates in previous Harambee Stars' match at Nyayo stadium n Nairobi. A point away from home and a 3-0 win at home against Ethiopia have seen kenya’s Harambee Stars scale two places up in the latest FIFA rankings released on Thursday to now sit at position 105 in the worldwide rankings. Stars had previously risen five places up in last month’s rankings courtesy of the 1-0 win over Ghana at Kasarani and the result against Ethiopia sees the team continue the upward trajectory under new coach Sebastien Migne. Ghana and Ethiopia have both dropped one spot down to position 52 and 150 respectively. Kenya remains the second best ranked East African country behind Uganda who have risen four spots up to 79th same as Tanzania who are now ranked at 136. Burundi are the biggest movers in the region going six places up to 142nd while Tunisia remains the best ranked African country having moved a spot up to 22nd while Senegal remained static at 25th and second best ranked country in the continent. Nigeria moved into Africa’s top three after scaling four places up to 44th, surpassing DR Congo who have dropped six places down to 46th. Meanwhile, world champions France have dropped one spot to second in the overall standings, with Belgium pipping them to top spot. Brazil and Croatia are third and fourth while England’s Three Lions have moved into the top five, swapping places with Uruguay who have moved to sixth.